Jules Buck Jones is a practicing artist living and working in Austin, TX. His work fuses interests in the natural sciences, the human psyche, and mythology. "Josie and the team really fell in love with this idea of a metropolis made using the Bestival logo. I'm quite a big fan of sci-fi, especially Blade Runner, so I associate ideas of the future with dystopias and utopias visually. I think that's why they picked me: my work generally has quite a futuristic resonance." Ames Bros. is a Seattle based company producing award-winning design & illustration. The company specializes in print design, logo design, and web design. Desert Trip 2016 (affectionately called Oldchella). Another year, another great Coachella poster from EMEK. Michael Cox is a Michigan Made, Chicago Resident Designer for Firefly Music Festival, The Warrior Dash, and Chicago Beer Classic. We love his cool, clean compositions and drool-worthy typography. The artwork for McDowell Mountain Music Festival was a collaborative effort of two artists, Zahi Mehmood and Eric Nagaran. Jon Contino's pretty handy with a pen and paper. In addition to this sweet poster for the Newport Folk Festival, he’s scribbled and sketched for some companies that you’ve probably heard of. He is inspired by his wife Erin, his daughter Fiona, and his home state of New York. The Mingarro brothers, Juan and Alejandro, were born in Huesca, and spent their childhood in Binéfar, drawing comics, building vehicles for their action figures and shooting movies with his domestic camcorder. In 2006, they founded Brosmind studio and stablished in Barcelona. Their style is fresh and optimistic and always uses fantasy and humor. Printmaker Tyler Hahn runs his Milwaukee-based design studio, Catharsis, with childhood friend John Griffin and illustrator extraordinaire, Audrey Lewis. We're huge fans of Travis Bone, the designer and illustrator behind several of our top posters of 2016. If redecorating your place is on the list of New Year's Resolutions, it would not be a mistake to buy a few festival prints from his amazing studio. Alessandro Gottardo was born in Pordenone in 1977. He studied art in Venice and illustration at the Istituto Europeo del Design in Milan, Italy. He works and lives in Milan. Nathaniel Deas is a socially awkward illustrator/graphic designer who enjoys drawing with pencil on paper. He listens to a lot of music and likes dogs. Based in Copenhagen, Mad Bergs is widely known for his modern art deco style and vintage graphics. His main fields of illustration are posters, brand illustrations, key visuals, editorial illustrations, cover art and murals. The illustrations are characterized by a style which translates classic poster art into a modern and timeless look. His pared back environments provide an elegant simplicity that delivers a concise narrative message. XLUSIV is a Colorado-based silkscreen poster shop. The artists teamed up with Vertex Festival and Conscious Alliance to host an "Art The Feeds' Food Drive in Buena Vista, Colorado, releasing this poster in support of both the festival and the community-based project. Rounding up the best music festival posters involves so much more than just the officially released versions. There are the VIP posters, announcement posters. event posters, commemorative posters, downstream treatments and much more. Running music festivals is a big business, but the festival poster is the mother of all promotional tools. All of these were included in our round up. Just like the up and down (and down) year it was, most of the 2016 music festival posters were quite varied. Still we were able to see three main trends emerging. One was a very simple design usually used for lineup posters, often including illustrations of indigenous trees of the festival’s locations. The next was an vintage Old Western-inspired design. This trend also included several illustrations of animals, most often wolves and bears, with a few turtles and birds thrown in for good measure. Nature featured prominently in many of the best music festival posters in 2016. Lastly, a futuristic type element was often embraced. From modern typography, geometric design and AI/robots, the Future theme proved strong and was even combined, as seen in the Pemberton festival poster. 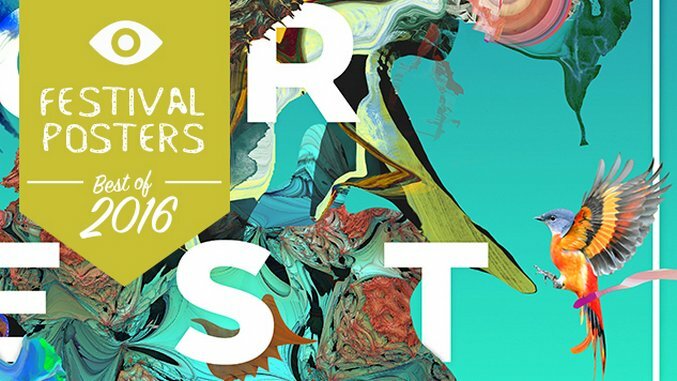 Check it out and let us know your favorite festival poster designs in the comments!